I've been reading your HanziSmatter blog for a while now and I've always found it equally amusing and educational. A little while back one of my friends has gotten his ankle tattooed as you can see in the attached image. He said it is something related to the concept of "family", but that the tattoo artist himself didn't really make it clear what it meant. I think this is supposed to be 家族 but backwards and poorly written. I think it's supposed to be 物家, google translate from chinese says "things at home", and japanese says "One house"
*In this combination, pronunciation probably changes to 「ものか」monoka. The google translate may be right, but I've never seen this word before. My Japanese is not perfect. However, 物 is usually used for actual items; such as - 品物「しなもの」Goods/ Items. 家族「かぞく」kazoku literally means "family," but there is no way someone could confuse it for the Kanji in the picture. Your friend may have gotten a crappy Kanji tattoo. Sorry. Anonymous (above) is correct. What your friend has is something like "things house" in Japanese. Family is "kazoku" and the characters 家族 are correct. Sorry to say, looks like a crappy tattoo to me. Actually I think it more resembles the characters 拆家 (chai jia). If that is the case, it would mean "take apart" and "house." Although it isn't used like this, but combination of these two together it roughly means "demolition (of house)." 1. 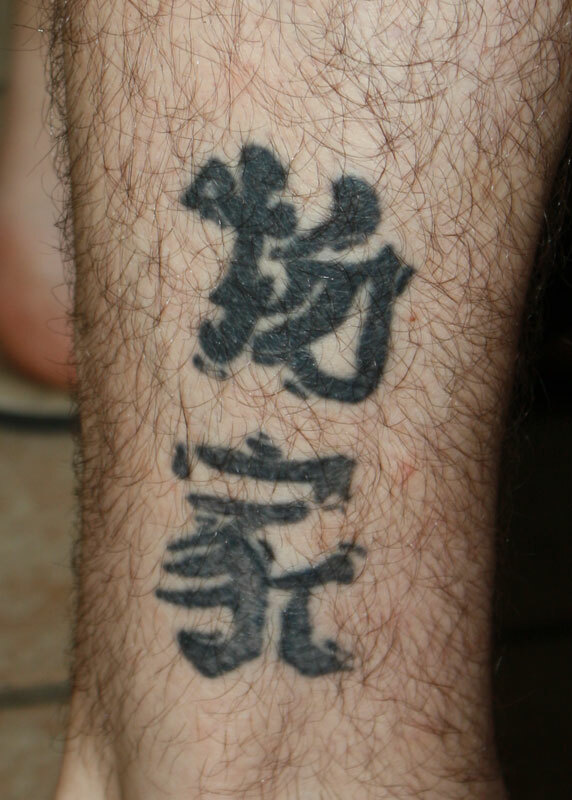 We have a tattoo artist partially aware of the hanzi smatter we all know and love. 2. In being slightly aware, the artist is also clued in on the conventional "wisdom" that Japanese (let's be honest, it's always Japanese with partially-informed idiots) is written "up to down" or "right to left". 3. The artist consults a dictionary, likely the ol' standby of Breen's Edict. 4. Artist misinterprets the dictionary entry as being written right-to-left, and corrects it until its wrong. Hence, ahem, "zokuka". Hehehe. 5. Artist needs to get a better view of the individual characters to ink them in, so selects them on screen. Most wrappers on Edict, including the popular Android and iphone versions (portable!) let you tap/click on each character to zoom in on it. The catch is, the zoomed versions are not just the character but a stroke order diagram. Hence the SOD arrows on the final tattoo. Moral of the story: a little knowledge can be a dangerous thing.